A sold out Fléda Club. Shoulder to shoulder. And yet, in this huge crowd you meet six classmates from the grammar school you went to in the first half of the nineties and a colleague with whom you later studied journalism. The band Dunaj (“Danube”) has returned to the stage after twenty years and its hometown was of course one of their first important stops. Even though the band has included many musicians over the years (among others Pavel Fajt, Iva Bittová and Pavel Richter), for the last few years of their existence it consisted of four musicians: the unforgettable singer with a sharply cut voice, Jiří Kolšovský, guitar player Josef Ostřanský, bass guitarist (among other things) Vladimír Václavek and drummer Pavel Koudelka. In 1998 the successful, and for the Czech alternative rock scene crucial, band ceased performing, and shortly after Kolšovský died at the age of 43. The band’s restoration in their former composition was immediately ruled out, just like the thought of reforming The Beatles after the murder of John Lennon. All three of the remaining band members pursued their own activities for the next twenty years – Ostřanský played in the band Boo, the duo/trio Kuzmich Orchestra and the solo project Ostrak Mode; Václavek played with Iva Bittová in a duo or in the band Čikori, made solo albums and played with the band V.R.M. ; and Koudelka was the drummer in the undervalued band Krutnava (whose existence came to an untimely demise with the tragic death of singer Pavla Kapitánová), played in the band Mňága a Žďorp and in drum projects with Pavel Fajt. The core of the reformed Dunaj was the band Dunajská vlna (“Danube wave”), which recorded the album Jednou (“Once”) in 2015. In it, Václavka and Ostřanský were accompanied by the drummer Michaela Antalová, and later at concerts by Dano Šoltis. But for the band to be able to call themselves Dunaj again, it was necessary for the duo (who had already cooperated in the group Domácí lékař (“Home doctor”) and in the punk band E) to team up once again with their colleague Koudelka. They were put together by the creators of the film Dunaj vědomí, who invited them to join them on a boat cruise on the Danube and a follow-up concert in the Banat area of Romania. The old spark was soon back, and the musicians created several new songs and the renewal of Dunaj was here. However, it was still necessary to answer a “small question” that plagues all the bands that lose a distinctive frontman (Queen is a good example): to find a new singer with a voice similar to Kolšovský, or solve it themselves? Unlike the aforementioned Queen, they chose option B and it was a great choice. In the new Dunaj, as in Dunajská vlna, the solos are sung by Vladimír Václavek and both colleagues help out by accompanying. And they certainly convinced their old fans here in Brno that this new Dunaj format is workable. More meditative songs such as the ever strong Cassiniho dělení (“Cassini’s dividision”) are Václavek’s realm without discussion. The bolder hits such as Barvy (“Colours”) or Jednou get a change from Kolšovský’s almost screaming voice to Václavek’s more civil, while still rock performance, giving the songs a new inner tension. Moreover, songs and semi-recitation is by far not the only thing on which Dunaj’s songs stand. In a recent interview, all three men talked about polyrhythms – since to count the times or to find the algorithm by which the three instruments intertwine requires a concentrated and expert listener. But it is also possible to not strain the mind and simple be carried away by the energy that the new Dunaj brings in droves. If I were to make a comparison to another reformed band, I would think of the Australian band Midnight Oil, who returned for a world tour after fifteen years. Their comeback at Colours of Ostrava was also exceptionally strong. 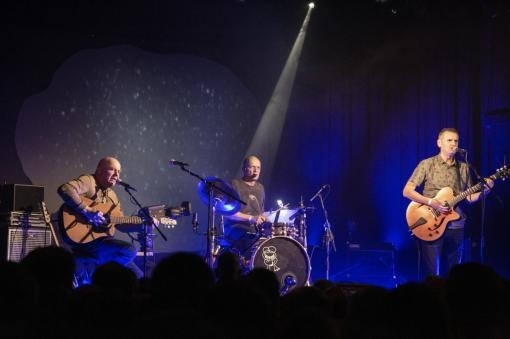 But while Midnight Oil came in their former assembly, Dunaj was able to perform reliably and with good quality from start to finish with only three members. And together with hits from the past, they gave us five new songs that are on a par with the quality of the old songs. I look forward to when the dark Vlny (“Waves”) with Václavek’s distinctive bass, Dunaj with Koudelka’s drumming performance and Ostřanský’s guitar effects or the polyrhythmic Potichu (“Quietly”) become part of the next studio album of Dunaj. Twenty songs in the main part of the concert and four additions (which were the repeated songs Barvy, Cassiniho dělení and Jednou, since the band says they currently don’t have anything else rehearsed) passed the time very fast. Generally, Dunaj’s songs – even with their gradations and often repeated slogans in striking, whilst not very talkative texts – tend to not be too long. The band does not try to prolong them by improvising and sometimes the end is a bit too sudden. But what is more important is that all three men have ripened in those twenty years, and now play with certainty, using all the experiences from other projects in all songs old and new, while still never forgetting to react to each other. And songs like Prší, Na jih (“Southward”), Kobylky (“Locusts”), My Dream, Barvy and my personal favourite Cassiniho dělení (with a well-chosen projection of Saturn’s rings) have been long-time members of the golden fund of Czech rock music. It was amazing to hear them once more, live and performed by Dunaj. It wasn’t the same river from twenty years back, but it was certainly filled with the same ferocious beauty. It was not only an iconic experience for a certain generation (hence the unplanned classmates’ reunions), but rather something much greater… I would say it was the concert of the year, if it wasn’t only January. But who knows, how it might end up?